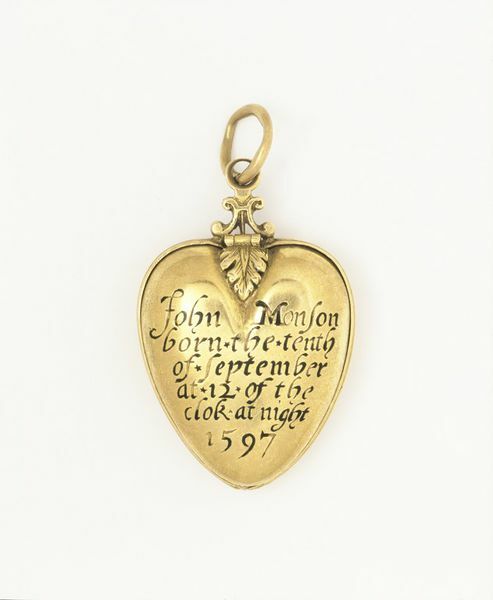 According to family tradition, this locket contains part of the caul (the membrane enclosing the foetus before birth) that John Monson was born with in 1597. This was considered to be lucky, especially as a protection against drowning. There was a strong belief in the medicinal or magical properties of various natural substances in Renaissance England. For instance, unicorn horn (actually part of the horn of the narwhal, an arctic whale) or bezoar stone, which was found in the stomach of a goat, were thought to be powerful antidotes against poison. They were often set in pieces of jewellery. It was customary at this time for both men and women to wear jewellery. Henry VIII (ruled 1509-1547) had made various attempts in the form of sumptuary laws to restrict jewellery wearing to the upper classes. In 1585 the Puritan Philip Stubbes complained that it was impossible to tell 'who is noble, who is worshipful, who is a gentleman and who is not' because jewels were worn by anybody who could afford them, whatever their rank. 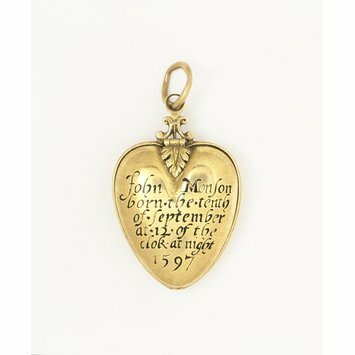 It is possible that this locket was made as a christening (baptism) gift. Almost all babies in Elizabethan England were baptised within a few days of their birth, although baptisms in higher status families might be delayed in order to make social arrangements. Gifts given at baptisms often included table salts or cups, silver spoons and other precious metal objects. It seems likely that this locket was given to John Monson as a keepsake after his birth. According to family tradition, John Monson was born 'within the caul' that is, with part of the membrance which encloses the foetus still over his head. This was, and is still considered to be lucky, and espeiclly to be a protection against drowning. The locket was made to contain this membrane and shows signs of heavy wear.